Richard Behling has been making kilts and other Scottish attire since 2002. 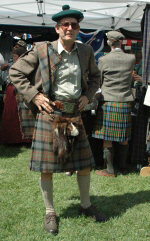 He has made kilts for himself and others using MacLaren yardage and a few other "creative" fabrics. His closet is filled with solid color kilts, camo kilts, pleat-to-stripe kilts, pleat-tosett kilts, some hand sewn, many machine-sewn, all using the knife pleat style. He has also made sporrans using leather, full mask fur from raccoon, badger and skunk pelts and even one using a turtle shell! He is a member of XMarksTheScot.com, the premier kiltweavers forum on the internet. He resides in Modesto, CA.